It is perhaps one of the most difficult challenges to teach and share God’s Word with one’s children. The task for a parent is one of helping to facilitate their child’s living faith in a way that they will not only remember, but also realize in the context of their own lives, and apply for years to come. However difficult this calling is, the rewards of such a commitment are invaluable and will without a question, greatly impact some of the most important relationships that a person can have — those within the family. 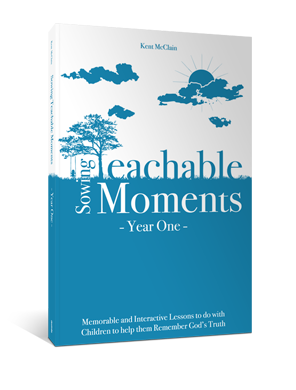 In Sowing Teachable Moments: Year One, Kent McClain presents 24 practical and interactive lessons to help parents navigate the complex and sometimes troubling experience of parenthood. This discerning work draws from over a thousand Bible verses, and hundreds of carefully chosen Scriptural passages which Kent carefully examines and applies. McClain’s work is also personally rooted in his own experience raising children and reflects the wisdom of his years spent building those relationships. Kent’s tone in this book is one of hope and he encourages parents to enjoy the children God has placed in their life, prioritize time with them as precious, and count the even the challenges as gifts. The aim of the book is to support parents in nurturing the hearts of their children as they grow in their relationships with God, build the skills of relating to others, and develop other necessary tools for living and thriving in the world’s ever-changing circumstances. Since this work is a companion to McClain’s other one entitled Teachable Moments, the two complement one another’s content and are ideally read together or in sequence. Both books illustrate and emphasize the value of sharing and discussing Scripture together as a family.